As requested, three intrepid Morris dancers checking in from Shanghai, China where we have been having an interesting May Day celebration, both in the dancing sense and in the communist regime sense. Our May Day celebrations began last night when we decided to do a bit of busking in the busy commercial district by the river overlooking the China Pearl (that crazy tower that sort of looks like the Seattle space needle). 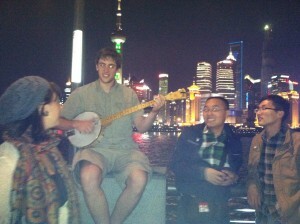 Jeremy was playing banjo, Tasha was singing, and Libby was fooling, dancing and being our caller on (in Chinese, no less!) We were only a few seconds into our first song when a crowd started gathering, taking pictures of us and with us and generally gawking at the strange instrument and crazy laowai who were performing traditional songs in English We had a little tin mug that we had purchased earlier that day for too much in a Chinese market. However much we had overpaid for the mug, it was returned to us in spades as the money started flying in. People gave us money to take pictures with us and in between songs Libby got her introduction to public speaking in Chinese There was some stretching of the exact meaning of some aspects as the movie “O brother where art thou” became “Where are you little brother? ?” Nevertheless, “I’ll fly away” was a crowd favorite. Libby grabbed some people from the crowd and flung them into a dance. After about 15 minutes we had made an astonishing 150 yuan and lots of new friends. It was at that point when the Chinese police officer stormed into the center of the ring of people, blowing his whistle and talking on his radio. Jeremy and Tasha kept playing while Libby–the fool, cultural interpreter, and crowd control–went to find out what was going on. He actually refused to speak to us, in English or in Chinese, but Libby heard him say “There are foreigners here and they have a lot of money!” over the radio. We saw the reinforcements on their way. It was time to make a hasty exit. We grabbed our stuff, and started walking quickly off. The police officer followed. As we left, Libby started talking to an old man who told us that apparently it is illegal to sing in public in china if you are not singing the glories of the Chinese nation! Probably the money didn’t help. We decided we really would rather not spend our holiday in a Chinese prison cell and made our best effort to disappear into the crowd. Unfortunately at 6’3″ (1.9 m) Jeremy towered above the population. We zigged, we zagged, we backtracked and after about 10 minutes lost our police trail. We hastily ducked into a subway station and made our escape. As we passed one CCTV after another, we realized that our faces are probably on some file somewhere in Beijing. If we don’t check in next May Day, come looking for us. Now we are off to a park, washcloths and Qing dynasty temple bells in hand, to dance in the May. With any luck, we will get the old Chinese folks doing tai chi in the park to join us in a May pole and Sellinger’s Round. This entry was posted in Features & Fun, Guest Posts, Updates from the Office and tagged English Dance, english dance music, Morris Dance on May 1, 2013 by Lynn Nichols. I can tell you that at the front right is Bob Hider, whose papers inspired two recent posts from Pat. The photographer, Genny Shimer, was a former CDSS director, teacher, and scholar. You can read more about her here and here (pdf). She authored, among other things, the modern Playford Ball (with Kate Van Winkle Keller) and our Genevieve Shimer Publications Fund is named in her honor. Traveling another thirty or so years forward, I never tire of watching Maple Morris: The Movie. If you need some morris inspiration and energizing, you can’t do better. Well… I didn’t intend this post to be a mini-retrospective of morris over the last 50 years, but it’s happened anyway. Time to get outside and step sprightly. Enjoy your May Day! Jack Langstaff is, of course, co-founder of Revels, along with his daughter, Carol, and he also led some weeks at Pinewoods for CDSS back in the day. I don’t know that we can say for certain that Genny took the photo, although it did come from the photo album that belonged to her and her husband, Jack Shimer. After Genny died, Jack Shimer married Joan Carr, who was for a time the CDSS Assistant Director. As Joan Carr, she was the recipient of Pat Shaw’s dance, “Quite Carr-ied Away, or Joan Transported”. And after Jack died and Joan was preparing to move, she asked that the album be passed along to CDSS. This entry was posted in History & Archives and tagged bob hider, Morris Dance, united nations on May 1, 2011 by Lynn Nichols. This past weekend, I was pleased to attend the CDSS Lifetime Contribution Award ceremony for Tom Kruskal. The Lifetime Contribution is presented annually to individuals who have made a long-term and exceptional contribution to the mission of CDSS. In 2010, there were two recipients: John Ramsay and Tom Kruskal. John Ramsay’s award was given on October 16, 2010 in St. Louis. You can read about that here (pdf). CDSS presented Tom Kruskal his award in Framingham, MA, on Saturday, April 2, where the greater Boston dance community celebrated Tom, and enjoyed one incredible party. For more than 40 years, Tom has — among many other things — nurtured morris and sword dancing in America, most recently establishing teams and mentoring innumerable young dancers. The Celebrate Tom! Committee (Karen Axelrod, Deborah Kruskal, David Fleischmann-Rose, Erika Roderick, and Andra Horton) did a superlative job organizing the party and planning the program. Over 300 people, from the Revels community, Tom’s church, and the music and dance community, joined in the festivities. Many past and present CDSS Governing Board members came, as did members of the CDSS staff — these are their impressions. Candyrapper taking the stage. Photo courtesy Arthur Ferguson. Tom's supporters managed to fill a large stage. Photo courtesy Marty Stock. As for me, it was both joyful and moving to be there. I had a wonderful time, reconnecting with old friends, helping out at the greeting table, and watching the spectacular dancing from Candyrapper, Pinewoods Morris Men, New Moon Sword, and Tom’s kids and teen teams: Hop Brook and Great Meadows Morris & Sword — with music by Tom, and others, on concertina. At the greeting table there were two baskets of ribbons, for past and present members of Hop Brook and Great Meadows to wear. A little girl was looking wistfully at the basket and obviously was torn about whether she could take one or not. She disappeared and reappeared a minute later with her Mom, who asked, “Can future members of the teams take a ribbon?” This little girl’s older siblings are team members, and she has been waiting more than eagerly to join Hop Brook herself and now that she is 9 1/2 years old, the moment is in sight. Past, present, and FUTURE — give that girl a ribbon! Visit cdss.org for an interview I did with Tom, music samples, and a tribute & chronology. Joel Gonzalez also posted two nice YouTube videos of Great Meadows singing “The Parting Glass” and their rapper finale. Thanks! This entry was posted in Updates from the Office and tagged cdss lifetime contribution award, Morris Dance, rapper dance, sword dance, tom kruskal on April 8, 2011 by Lynn Nichols. Meetup.com: A Resource to Consider? Is this a useful resource for dance and song organizers? Over the last few months, I’ve heard from a few groups about their experiences using the online social network Meetup to attract new participants. I’ve even seen its effect at a local dance. This got me wanting to find out a little more about Meetup and how dance and song organizers have been using it. I don’t have enough anecdotal information to really know how useful Meetup can be for dance and song groups, but let me share what I do know. How this sentiment works in practice on their site is that organizers create groups (and pay dues of between $12-$19/mo) and those groups have members and events. Meetup contra dance groups and interested members across the globe. There are a number of Meetup groups out there done by the organizers themselves. Contra dance and square dance both generate some hits across the country. English Country Dance doesn’t seem to have a lot of representation, with the notable exception of the Las Vegas Country Dance group. There is a little morris out there as well. “Folk song” and “folk music” generate lots of hits of various stripes. Looking through these can give you a sense of how organizers might use Meetup. There’s another way Meetup can impact communities, too: a broader Meetup group can decide to go to a dance as one of their activities. This can happen when one of the organizers of a group that finds fun, unusual things to do decides contra dancing sounds interesting. I experienced this type of Meetup effect at a dance recently, when this contra dance was sponsored by the Nerd Fun – Boston, a group with almost 3,000 participants. Lo and behold, a group of a dozen or so descended on the dance. A little effort and money can give you a Meetup site, but is it worth it? I don’t know. While $12/month isn’t a huge investment, it’s not a drop in the bucket either; it’s only going to be worth it if you see results. If you have several groups with close missions (e.g. contra and English or pub sings and a morris team), I could see combining forces to share the burden. So, have you used Meetup or something like it to promote a song or dance event and/or find new participants? How? Did it work? Please leave a comment. I’d love to hear about it and I am sure others would as well. This entry was posted in Features & Fun, Ideas & Resources and tagged contra dance, english country dance, meetup, Morris Dance, social networking, song, square dance on February 1, 2011 by Lynn Nichols.